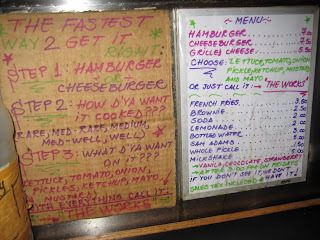 Our Expectations: The Original Five Napkin Burger. It's supposed to be big, 10 ounces of fresh ground chuck to be exact, and damn tasty. As a cheese lover, Brett's totally cool with the idea of Gruyere cheese, while Kyle on the other hand has his reservations. *Fyi, Five Napkin's website lists Comte as the cheese used with the Original Five Napkin Burger. Gruyere, as listed in our picture of the menu, is also known as Gruyere de Comte. Meat: Close to being the perfect combination of flavor, texture and juiciness. 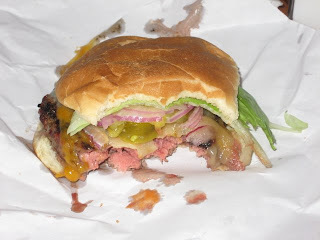 Surprisingly, the outside of the patty throws you a curveball with the first bite, providing what we termed "crispy" but what most culinary experts would probably call "seared." The crust leads to a tender, juicy center....yeah its dirty, deal with it. It's that damn good. We don't know how else to explain it. Yet, as pleased as we were with the flavor and texture, that's how unhappy we were with the heat and finishing temperature. We ordered our burgers medium-rare. And medium-rare should always be that, medium-rare! Both our burgers came more like a medium to medium-well finish. Not cool. Still, we couldn't deny the awesomeness of the flavor. 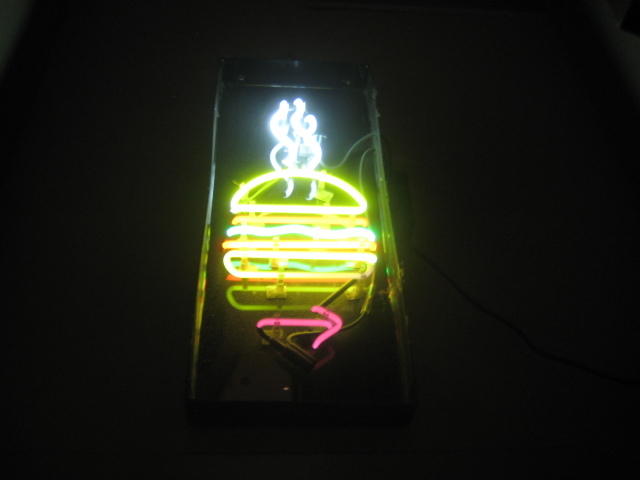 On a side note, no excuses if you order a medium-well burger. If you do, we can't be friends. Toppings: Here's where we differ. Brett, totally cool with the Gruyere cheese. 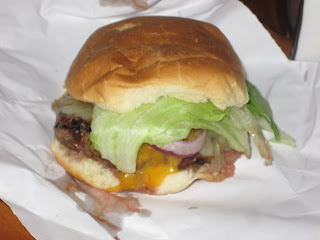 In his eyes, the cheese blended extremely well with the burger's flavors and other toppings. Specifically, considering they use a rosemary aioli, the cheese just fits...but more on that aioli in a minute. Kyle, on the other hand, wished they could throw some Blue Cheese or maybe White Cheddar on the patty. Mainly because Gruyere reminds him of french onion soup... thanks Mom. Still, we both agree, the cheese melted fantastically well on the meat, smothered to perfection. In addition, the caramelized onions offer a nice sweetness to every bite. Solid stuff for sure. Now, back to that aioli. A bit much. Maybe it was just a heavy hand of the chef at the time we sat down. Yet, if you love rosemary, you might want to get to Five Napkin fast, before he eases off the rosemary gas pedal. Don't get us wrong, it also fit well on the burger, but we'd rather have the meat as the star, rosemary should be the understudy. Bun: Not much to say here except...soft white roll, awesome. Perfect choice and size. It held up well with the weight of the burger and didn't get soggy or sloppy. It threw in some added value, always something we look for. Meat (42): Superb flavor and texture, but a little overcooked. Toppings (20): Creates a unique flavor, but the rosemary was a little overpowering. Bun (21): Couldn't ask for a more solid choice....use these at home!